Social media's rise has affected human interactions in significant ways, and such media may support learning. But how to prepare teachers who can maximize the educational potential of these technologies remains unclear. In this chapter the authors aim to summarize and synthesize extant research concerning social media use in teacher education, specifically attending to methods, theories, and findings. They begin by defining and situating social media with an eye towards affordances and drawbacks. The authors discuss pertinent research through the lens of experiences various mediums afford individuals and groups, including enhanced interaction, discussion, collaboration, community, feedback, mentoring, and support. 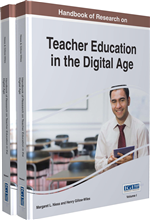 Opportunities and challenges associated with the use of social media in the preparation of teachers in and for the digital age are discussed, and the chapter concludes by detailing implications of the existing literature for theory, practice, and future research. Social media is not easily defined (Mandiberg, 2012) as it is a “moving target” where “it sometimes feels as if the social media landscape changes too quickly to fully grasp and leaves scholars permanently lagging behind” (Hogan & Quan-Haase, 2010, p. 309). Although social media definitions and classifications can be ambiguous and fluid, there are similarities among the types of experiences various mediums encourage. Social media is generally characterized by digital platforms where users can create, share, and interact with content and each other in online collaborative spaces. Accessibility and low barriers to participation typify social media tools, and the content created and/or shared by users includes text, photographs, videos, audio files, or some combination thereof. While terms like Web 2.0, participatory media, social networking, or authentic media have been used both synonymously and distinctively, the term “social media” is used in this chapter for two reasons. First, “social media” is a broad term that did not arbitrarily limit the review of literature. Second, the “social” component distinguishes various mediums and uses. For example, while some Web 2.0 sites provide an accessible digital space for content (e.g., YouTube, blogs), not all such sites encourage or lead to frequent and substantive interactions in comment sections or elsewhere. On the other hand, social networking sites (SNS) like Facebook often lend themselves to more interactions as posts can lead to numerous “likes,” “comments,” or “shares” from fellow users. However, while a medium can encourage certain behaviors, it does not determine them and the specific technology tool is often less important than the quality of content and interactions crafted by users. Facebook: A popular social networking platform. Social media: Digital platforms where users can create, share, and interact with content and each other in online collaborative spaces. Blog: A personal website or web page on which an individual records opinions, links to other sites, etc. on a regular basis. Microblogging: The posting of very short entries or updates on a blog or social networking site. Wiki: A type of website that allows collaborative editing of its content and structure by its users. Ning: An online platform for people and organizations to create custom social networks. Twitter: A popular microblogging platform.